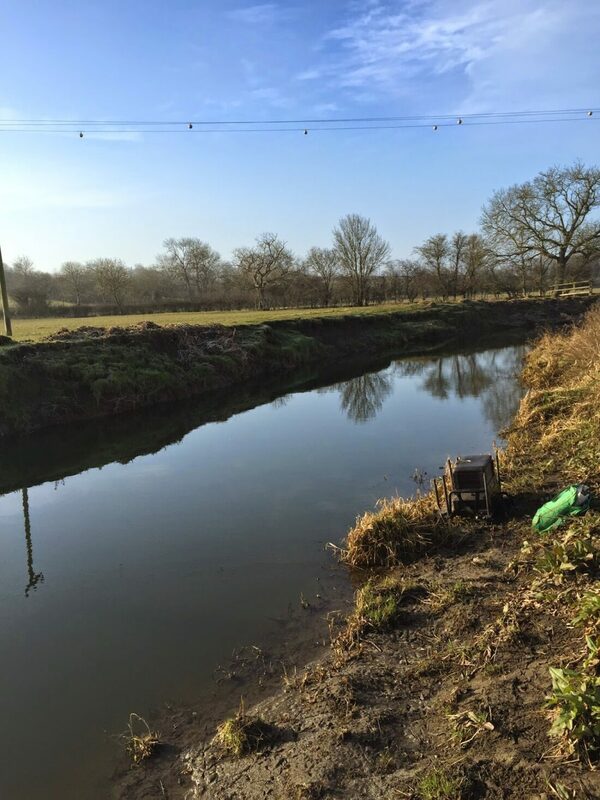 With the river producing some cracking nets of roach and chub, a few new faces had booked into the open, the trouble was we’d had a week of bitterly cold frosts and with the river really low and clear, it could be hard going for some. Rob walked miles on the Saturday looking at the river to try and make sure he could give everybody the best possible chance of catching fish. We had another frost overnight and I must admit I was fearing the worst. 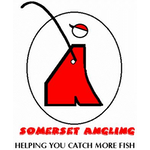 I got to the pub and along with the regulars, it was fantastic to see Scott and Roger Russell, Jamie Parkhouse and Paul Homewood had turned up, hopefully they’d catch some fish and we might see them again. Rob had put six pegs in at Hambridge and we haven’t used this stretch for a few years so nobody was really sure how it would fish and to be honest I felt it was a bit of a gamble, although the first two swims above the bridge had been good the last time we fished it. After a coffee and a bacon sarnie it was time to draw and everybody was hoping they’d pick out peg 109, I also quite fancied 112 or 125 but after I stuck my hand into Rob’s hat I managed to pull out peg H3 at Hambridge which I thought would put me on the first peg above the bridge where I finished second the last time I’d fished it so I was quite pleased with my draw. It turns out I was actually the third peg above the bridge which was a bit of an unknown quantity. Justin was the lucky angler to draw 109 and we all thought we’d be fishing for second place, Jamie P was on 125, Scott had pulled out 123 which isn’t my favourite peg but has been good for 6-7lb and I felt a bit sorry for Roger as he was on peg 124 which hasn’t been great, he did have the choice of 124a but nobody has fished that peg much recently. Meanwhile down at Hambridge Paul Homewood was on H1 (where I thought I was) and Andy Welch was on H2, Baz was on the peg below the bridge with Neil Dring in H5 and Heardy in H6, the last time these pegs had been in they’d only thrown up odd chub. I parked up and walked across the field to my peg and found my swim which was just above a bend, it looked like I’d be able to get down near the water but what I thought was solid bank was actually very soft mud and I sank down past my ankles which wouldn’t have been a problem apart from the fact I still only had my shoes on! I pulled myself out of the glutinous mud and got the rest of my kit out of the car and put my wellies on. I moved my box slightly upstream which was still boggy but I managed to get reasonably comfy although my box legs sunk into the mud fully extended and my fishing station had an alarming tilt to it and I hoped it wouldn’t lean forward any further and deposit me in the river! H3 my peg for the day, it looked like the Battle of the Somme by the end of the match! I had intended to put some groundbait in at the start but after plumbing up it was a bit shallower than I would have liked so didn’t bother mixing any up. I set up two rigs, a 1.5 gram Drennan Carbo with 0.12mm bottom and size 18 Kamasan B611 for the deepest part of the peg in the main flow, I also set up a 1 gram bodied float with the same hook and hooklength to fish further across where it was slightly shallower. Andy shouted the all in and I started with the heavier rig down the middle with double red maggot at about 8.5 metres. As I was expecting roach, the first few minutes normally determine what sort of day you’re going to have, if you catch straight away then there are fish about and you could be in for a good day, no indications and a hard day is on the cards. After 15 minutes and no bites, the writing was on the wall, I finally had a couple of knocks holding back in the flow at 10 metres down the peg but still no fish! I finally connected with a fish after half an hour when the strike resulted in a minnow flying out of the water before dropping off and I was still blanking! After an hour I’ve managed to get my first fish in the net, a small roach, I had another and then a gudgeon but was going nowhere fast. There was also a sunken branch or something slap bang in the middle of the peg and I hooked it a few times and lost a hooklength. I tried the shallower rig and added a few more small roach, tiny gudgeon and a mini dace but I hadn’t got a pound yet and we were halfway through the match. I saw Heardy walk up from below the bridge and walk across to see Andy so I thought I’d go for a wander and see how they were getting on. Martin said he was struggling and only had a couple of small fish and Neil was in the same boat, Baz, Paul and Andy on the other hand were all sacking right up! As we knelt behind Andy, he had several nice roach on the stick float and had also landed a couple of nice chub and a 12oz perch, I could see Paul swinging in loads of roach on the whip and there were obviously loads of fish in the swims either side of the bridge. You could probably put another two or three pegs in and they would all catch which is something to bear in mind for the future. It did cross my mind that if those three framed it probably wouldn’t take much to win the section by default, especially as Heardy had already packed up! So after finishing my coffee and with two hours left I wandered back to see if I could find a few more fish. I slipped two red maggots on and shipped out to 10 metres where I had been fishing before and held back in the flow, as Heardy walked back down to see Paul, the float buried and I struck expecting another tiny roach or gudgeon to fly out the water but what actually happened was the elastic streamed out of the pole and a decent fish was on! I shipped back and played the fish with kid gloves only for it to go through that poxy snag in the middle of the river and was stuck solid. 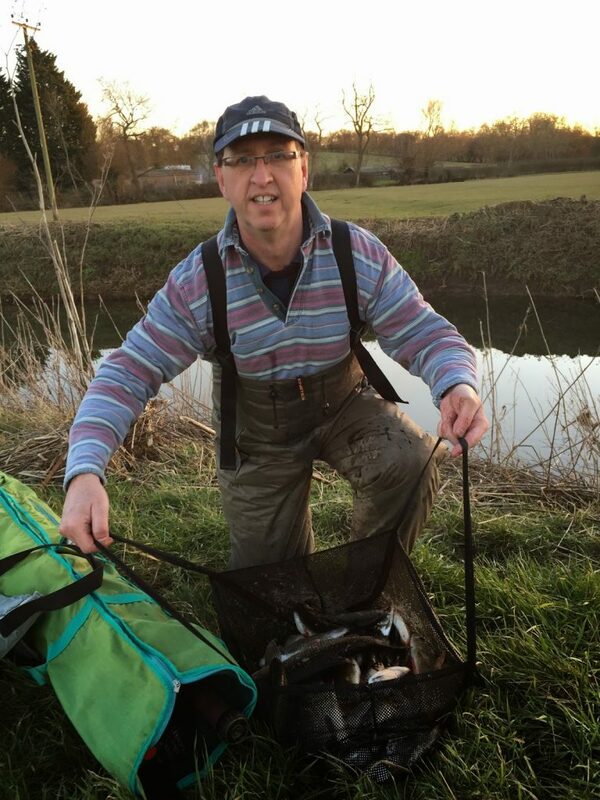 I really thought the fish had gone but I gave it as much welly as I dared and eventually something moved, I flung the pole back and bullied the fish using the pulla bung and slipped the net under a chub around the pound mark – bonus! Next chuck the float barely settled before away it went and this time I was ready, I quickly swung the pole round so it was parallel with my bank to keep the fish away from that snag and chucked the pole back, this one was better at about 2lb and both fish had been full of casters. Next chuck I had another around the same size and the swim was now solid, I had six one after another for about 10lb and all of a sudden thoughts of a section win were replaced with me thinking I could actually win the match. Typically it then slowed up and my next fish was a 6oz roach which was still very welcome but to stand any chance I needed a few more chub. I had a smaller roach which was followed in by a jack pike and then a big pike swirled for a better roach and all of a sudden the swim was alive with fish. A few more roach followed before I hooked a big fish which shot upstream and I thought I had it under control when it snagged me, I stuck sections back on and changed the angle of pressure and eventually it came out and was my best chub yet at around 3lb. I thought I now had 12-13lb but felt I needed another to stand any chance of beating the other three. I didn’t get it although I did catch a couple more nice roach including one right on the whistle. Jamie P had turned up and was sat with Paul for the last hour, he’d struggled in 125 and said you could see every stone in the peg, he reported that it had been a struggle for most at Isle Brewers. I packed up and took my mud encrusted kit back to the car before walking back with Andy to start the weigh in at Paul. He’d had a lovely day catching mainly roach around 1-3oz and had only used his landing net twice, after two weighs, his total came to 20lb 13oz, what a cracking net of fish. 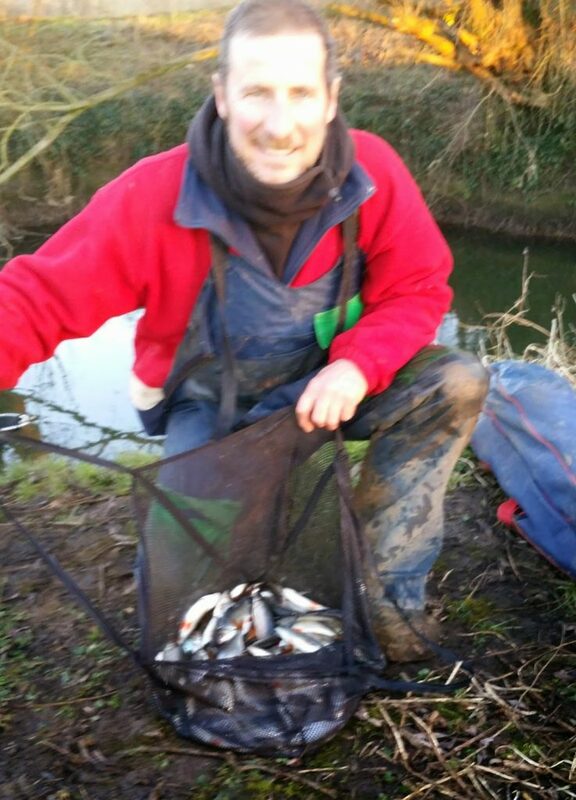 We then walked up to Andy and when he pulled his net out he’d had a lovely day too, he had some real quality with several chub to around 1.5lb, three 12oz perch plus a load of roach, his net went 16lb 11oz. Then we got to me and my seven chub plus a few roach went a level 13lb and the way the weights were going I might not even win the section! 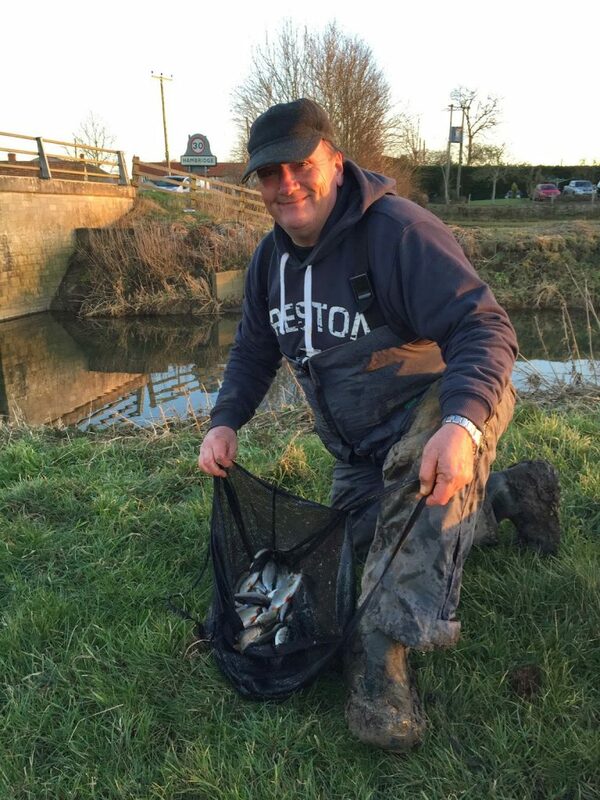 ﻿I loaded the car and as I drove back over the river, Baz was just loading his van, I stopped to ask how he’d got on, Paul said Baz was admitting to 20lb so I thought he might have a similar weight to him so I was amazed when he said he’d weighed 29lb 6oz and he was only 33% out with his estimate this week! All joking aside, what a fantastic net of fish, he said he’d had a few chub to a pound plus but he’d caught mainly roach with one beauty around 1.5lb. That’s the second time he’s had 29lb on the Isle and he doesn’t fish if very often! 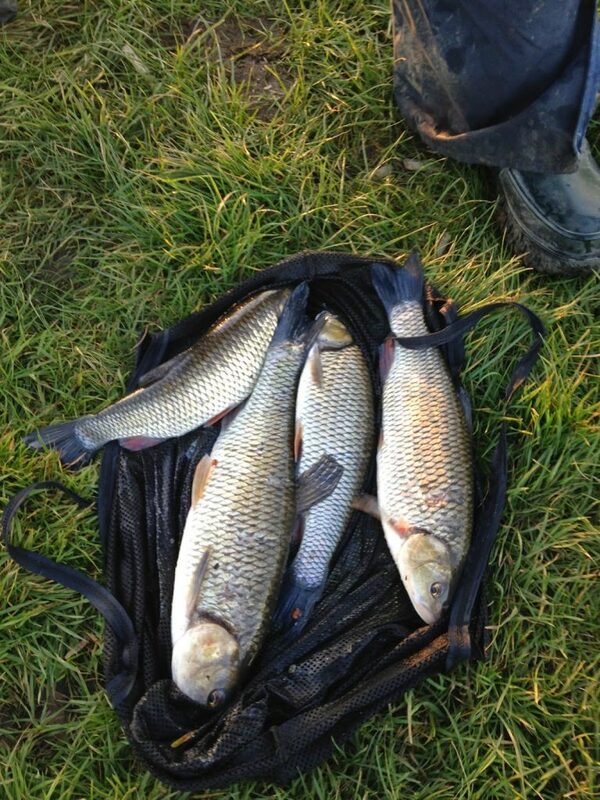 Neil had found a few roach late on to weigh 2lb 5oz but had lost a big chub which would have boosted his weight. So I was lying in fourth place (out of six pegs) and Rob was paying four today but I fully expected Justin in 109 to beat my weight as well. Back at the results and Justin hadn’t caught in 109 which just goes to prove the same pegs won’t do it week in week out and I hung on to fourth spot and picked up £20. Hurf had a fantastic day in Barney’s Bend catching 12lb 4oz to win the section and christen his new pole in style, as far as the side bet was concerned it was a case of ‘close but no cigar’ as he handed over another nugget. 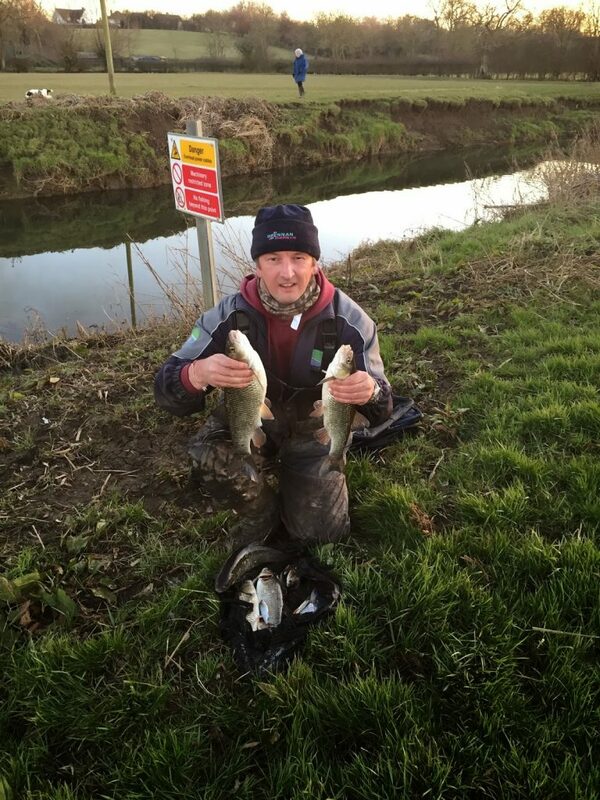 Jake Woodard won the other section with four chub for 7lb 8oz from peg 112 and lost a further five which could have seen him challenging for a top three place. Elsewhere Scotty had 5lb 10oz from peg 123 which seems to be par for the peg, Roger struggled in 124 as did Rob in 128 and Fieldy in 129, where have all those roach gone? down in Baz’s peg I reckon! So some amazing weights today and it’s great that a new stretch has produced them although I’m realistic enough not to carried away as those fish are only in certain pegs. 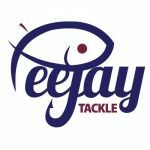 As I said in my last blog, we need to try different areas but the trouble is not every new peg or stretch we put in will produce and winter river fishing can be very unpredictable but then the same applies to commercials too. The club has a lot of water and Rob does an amazing job walking the river as it takes up a lot of his time. I do think it’s important to keep trying different sections though as we can’t keep hammering the same pegs every week. Funnily enough I was on the River yesterday too! I drove over the bridge in Hambridge and looking left watched a fella furiously fishing away on the pole and he hooked something quite reasonable. I would have pulled over and gone for a strole had I know the stretch was in but I had "been summoned". Still nearly 30lb is a great weight. I walked for miles to find stretches deep enough to fish, some of the parts were crystal clear and inches deep! Somerset rivers really on fire at the moment. These Commercial anglers are really missing out. Good recovery on the day mate. Thanks Ivan, I see you've been bagging up too, I must try and get on the Tone soon.